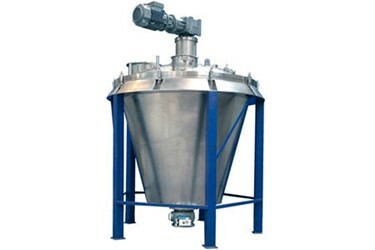 Low energy Mixers for rapid and efficient blending of free-flowing powders. Gentle Mixing – Low energy, gentle mixing action with minimal heat generation is ideal for mixing of heat sensitive or fragile products. Accuracy – Vertical Mixers are especially successful where small trace elements are required to be mixed in large quantities of carrier or base material. Versatility – Working capacity can range from 20 – 100% without losing any mixing accuracy. Fast Mixing – Batches can be mixed rapidly meaning high production capacities can be achieved.